Areas of my garden have a soundtrack in my mind. Flowers, too. This one in particular though? It plays often when I check in on its status out in the garden. I had ordered a box full of bulbs last Fall, and AdRi got them into the ground for me at the very last minute before Winter hit. This little freakshow? It's been tempting me for weeks now. Marvelous twirling leaves, followed by a vertical stalk that just kept growing taller and taller. Until it unfurled and twirled the freakshow that it is. And because I know you're wondering, it is a Nectaroscordum - siculum ssp. Bulgaricum. I think we have a new series on the blog. Welcome to Soundtracks from the Garden. Feel free to join in and start your own! What songs play to you in your garden? Any freakshows going on? Ha! You know my baby is totally grooving to this, right? That's incredible. 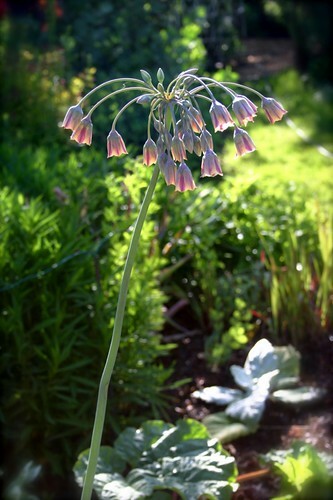 I planted some fritalaria bulbs a couple years ago that look really similar. Well, they're SUPPOSED to look similar but mine never came up?? I think I'm going to have to get some of these -- beau-ti-ful.